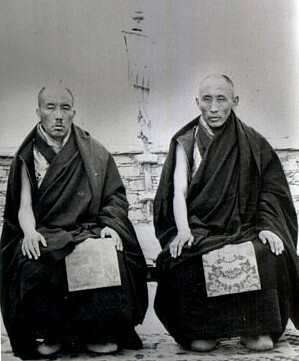 Minling Khenchen Ngawang Khyentse Norbu (Tib. སྨིན་གླིང་མཁན་ཆེན་ངག་དབང་མཁྱེན་བརྩེའི་ནོར་བུ་, Wyl. smin gling mkhan chen ngag dbang mkhyen brtse'i nor bu) (1904-1968) - Eighth in the line of Minling khenpos. His father was Pema Wangchen and his mother was Chimé Deden Drolma, the daughter of Gyurme Yishyin Wangyal, the eighth Minling Trichen. He was born at Mindroling in the Wood Snake year. He learnt all the common sciences, beginning with reading and writing. He took monastic ordination with Dordzin Ngawang Norbu and received extensive sutra and mantra teachings from him. He also received many teachings, empowerments and Dzogchen instructions from the great khenpo Jampal Dewé Nyima. He was resident for a while at Lumo Rab in Nyarong, where he gave ordination to members of the sangha and gave empowerments and transmissions. He also spent some time at Tserong Draknak monastery, which is a branch of Mindroling, where he gave the entire Dzogchen Ati Zabdön Nyingpo. He received the Rinchen Terdzö from the sixth Shechen Rabjam Rinpoche at Mindroling. When Jamyang Khyentse Chökyi Lodrö gave the Nyingtik Yabshyi at Mindroling, he gave an elaborate speech in his honour. His students include Taklung Tsetrul Rinpoche, Trulshik Rinpoche and Khotrul Rinpoche. He composed a commentary to the Third Dodrupchen's Key to the Precious Treasury entitled 'Sun of this World' ('dzam gling nyi ma).